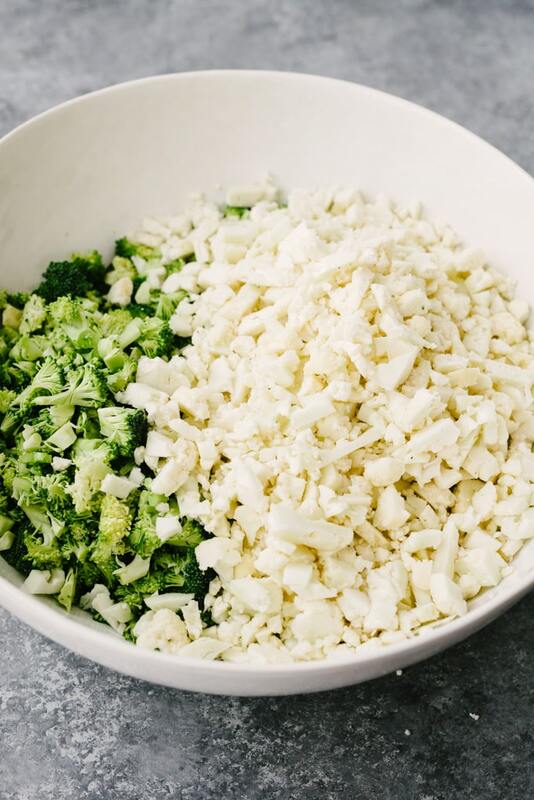 Ditch the mayo and embrace this healthy broccoli and cauliflower salad! 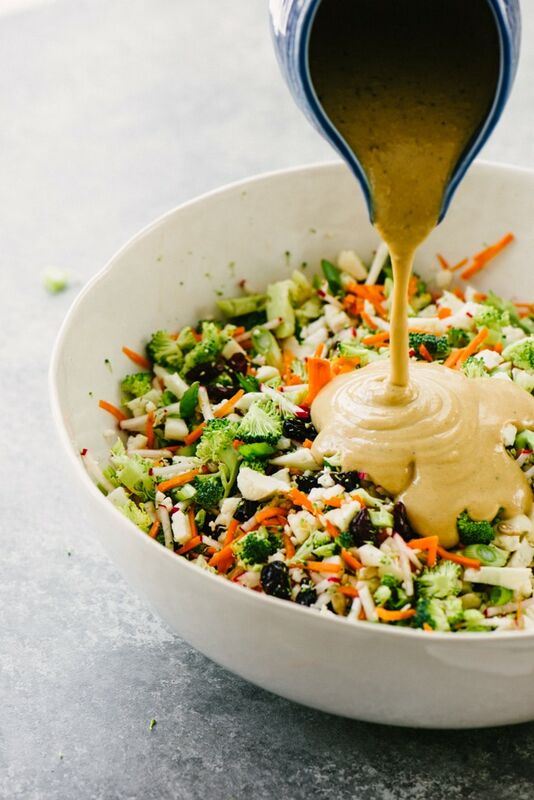 It’s a flavor bomb packed with crunchy vegetables and a creamy sunbutter sauce. Perfect for lunch prep, picnic prep, or a simple side dish. >>> Pin it now! 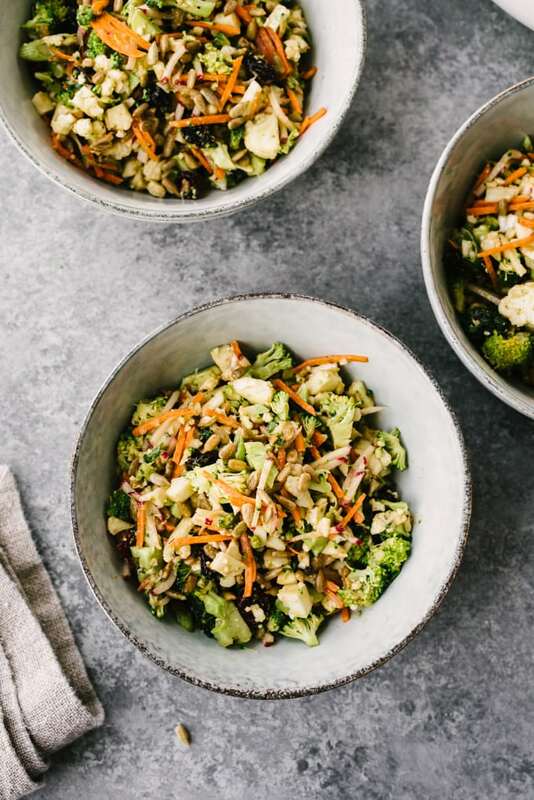 Click here to save this Broccoli and Cauliflower Salad to your Healthy Salads board on Pinterest! One of my youngest son’s first words was “buh-bye”, and to this day it’s one of my favorite memories from his early talking days. In additional to using it in contextually appropriate ways, it was also a signal that he was done with something. We’d be eating lunch, and he’d suddenly declare “buh-bye”. Or playing legos, having a snuggle, or taking a bath, and out it comes. Buh-bye! I’m done with this Mama. He might have had limited words, but he sure knew how to articulate his needs! 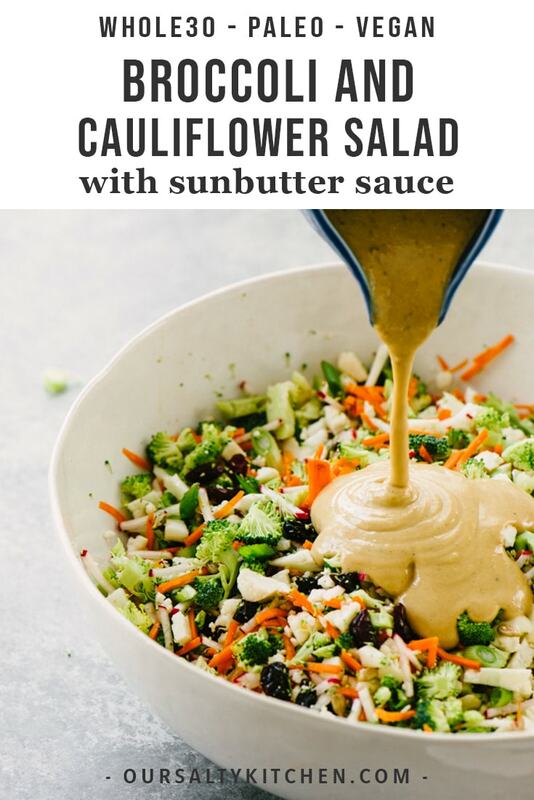 It’s in celebration of this hilarious memory that I bring you this recipe for Broccoli and Cauliflower Salad with Sunbutter Sauce. BUH-BYE heavy, mayo-laden salads. HELLO super clean! A creamy, flavor-packed broccoli and cauliflower salad that’s completely mayo free? Yup, that’s a thing. A salad that’s vegan, paleo, Whole30 and so delicious that you’ll be scrambling for seconds? Yeah, that’s a thing too. This broccoli and cauliflower salad is perfection. It’s hearty enough to stand on its own, but plays well with others in a potluck situation. It’s make-ahead friendly and perfect for meal prep. Toss in a little chicken or bacon, and you’ve got a complete meal. It’s crunchy, nutty, just sweet enough, and seriously loaded with nutrition. Say goodbye to standard cruciferous salads weighed down with mayo and cheese. You won’t miss either in this super clean, but totally flavor-packed salad! 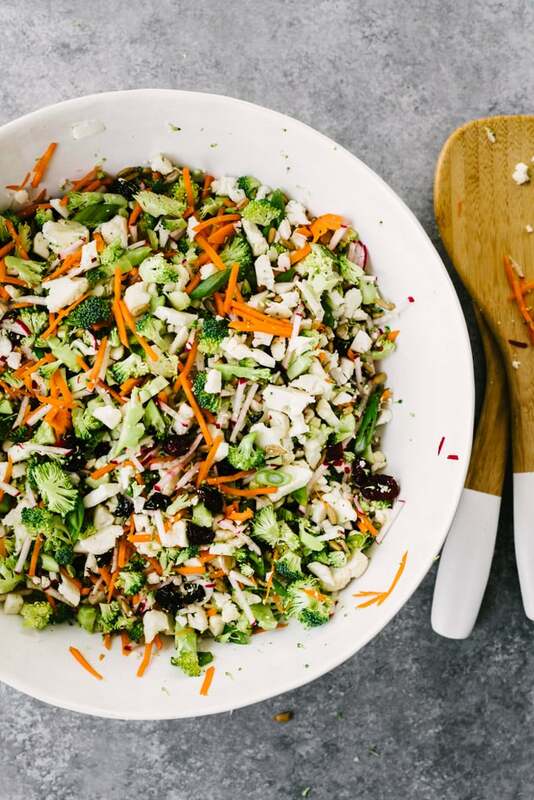 VIDEO: Watch How to Make this Broccoli and Cauliflower Salad! 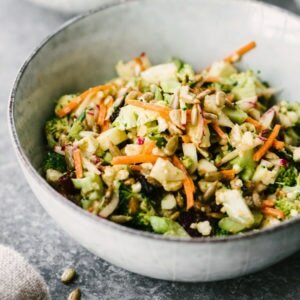 This broccoli and cauliflower salad is made with a combination of raw chopped vegetables, sweet and tart dried fruits, and crunchy sunflower seeds, then smothered with a creamy, tangy sunbutter sauce that’s finger-licking good. The sunbutter sauce is the perfect alternative to mayo – it’s super creamy, with the same tangy finish. It’s squeaky clean without sacrificing a bit of flavor, and since everything is raw, it’s a snap to pull together! Prep this salad properly and you’ll be rewarded with the perfect balance of crunchy, sweet, salty, and nutty in every bite. That magic starts with teeny, tiny broccoli and cauliflower florets, and the process couldn’t be easier. Start by chopping a head of broccoli into florets. Slice each floret lengthwise (from top to bottom) into several pieces. Then chop those pieces widthwise into tiny florets. Do include the stalks – those guys are packed with both crunch and flavor. Tiny cauliflower requires an extra step because the florets are packed a little more tightly and don’t fall apart quite as naturally as broccoli. Start by cutting a floret into slices, like you did with the broccoli. Then slice those pieces a second time lengthwise to create long pieces. And then chop those long pieces up into tiny pieces. BOOM! A bowl of crunchy cruciferous goodness! To create a little texture diversity, I went with shredded carrots and radishes. They’ll stay super crunchy, even after a few days in the fridge. I use my trusty vegetable mandoline with the julienne attachment, but the large side of a box grater will also get the job done, and done well. Pre-shredded carrots also work perfectly! For a creamy, mayo free, flavor packed dressing, look no further than this sunbutter sauce. It’s nutty flavor is the perfect compliment to the bright and clean vegetables and sweet dried fruit. I use my food processor to blend this up, but the smoothie attachment on a blender works well too. 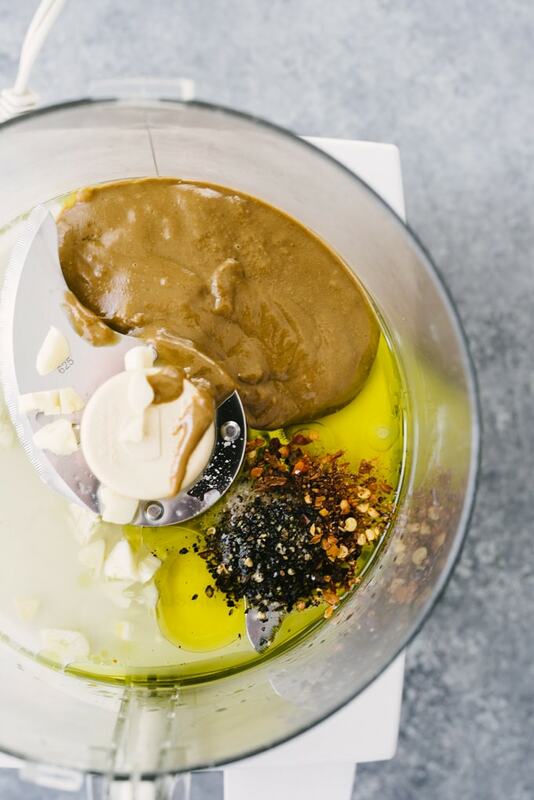 Toss the sunflower seed butter, olive oil, lemon juice, garlic, salt, pepper, and red pepper flakes into the bowl of a food processor and then give it a few good pulses to incorporate the ingredients. It’ll be thick at this point, so flip the motor to continuous and then pour in the water through the feed tube, about a tablespoon at a time, until it emulsifies into a smooth, creamy, pourable dressing. I used about 2 tablespoons to achieve a medium-thick texture. The red pepper flakes are optional and definitely add a kick. Skip or reduce the amount if you’re not a big fan of heat. Be sure to check for seasoning after you’ve finished processing. Is it a little bland? Add a bit more salt. Too spicy? Adjust the heat by adding a teaspoon of lemon juice and a tablespoon of sunflower seed butter. You want it to taste WOW to YOU. Pour the dressing over the salad, toss, and voila! You’re done. Who needs mayo? No you! 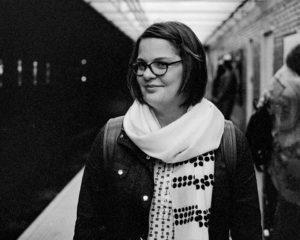 What is sunbutter? And where can I buy it? Sunbutter is just like peanut butter, but made with sunflower seeds. I always have it on hand because my son’s school is nut-free, and it’s great for a modified PBJ. You can buy it at most major grocery stores (it’s available in two brands from my local Giant), Trader Joe’s, and Whole Foods. It’s a little pricier than peanut butter, but the flavor is worth it! Do I need to cook the broccoli and/or cauliflower? Nope! This salad is perfect with raw veggies. Can I cut the veggies larger? Sure! I like the smaller texture of tiny broccoli and cauliflower florets, but feel free to cut them into larger, bite-sized pieces. Make it yours! Can I make this ahead of time? Yes! It actually gets better after a day of marinating. Make it ahead and keep in a tightly sealed container in the fridge – it’s a great dish for a potluck. This salad is also a dream for meal prep. It’s super portable, delicious cold or room temperature, and keeps well in the fridge for about five days. Divide portions into individual lunch containers (I’m a big fan of these guys) and you’ll have a grab-and-go flavor bomb for lunch every day of the week. 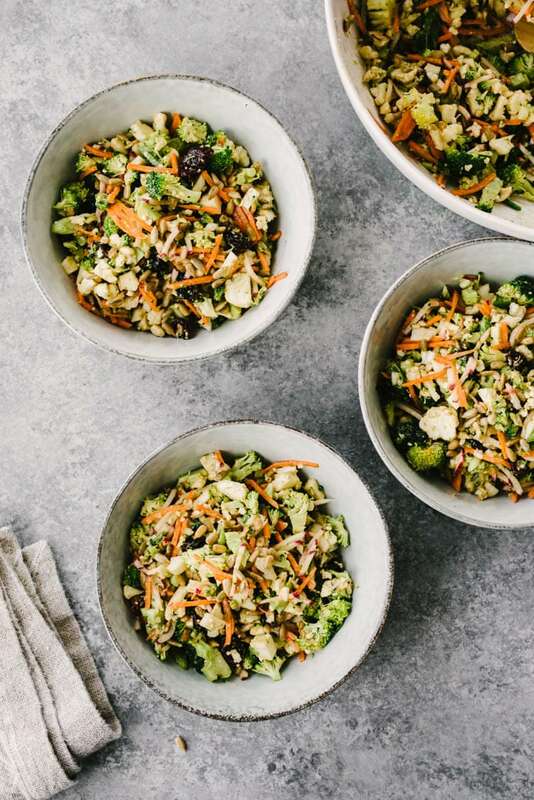 Is this broccoli cauliflower salad healthy? I think so! It’s naturally vegan and Whole30-compliant, totally sugar free, and super clean – but I promise you don’t need to subscribe to any particular diet to enjoy it. What are some tasty substitutions? While I love this salad as-is, feel free to make it your own. 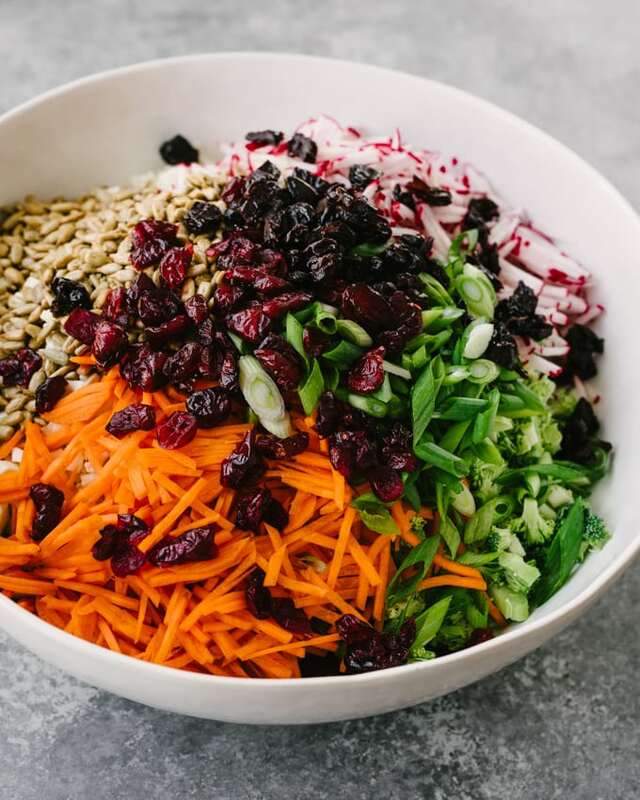 Use raisins or diced dried apples instead of cranberries and cherries; use slivered almonds in place of sunflower seeds; try diced red onion instead of green onion. Try adding a diced cucumber instead of radishes, or adding in a diced apple. Can I make this with protein? Yes! Add a half cup of cooked and chopped bacon, or a cup or two of pulled chicken or diced cooked chicken. 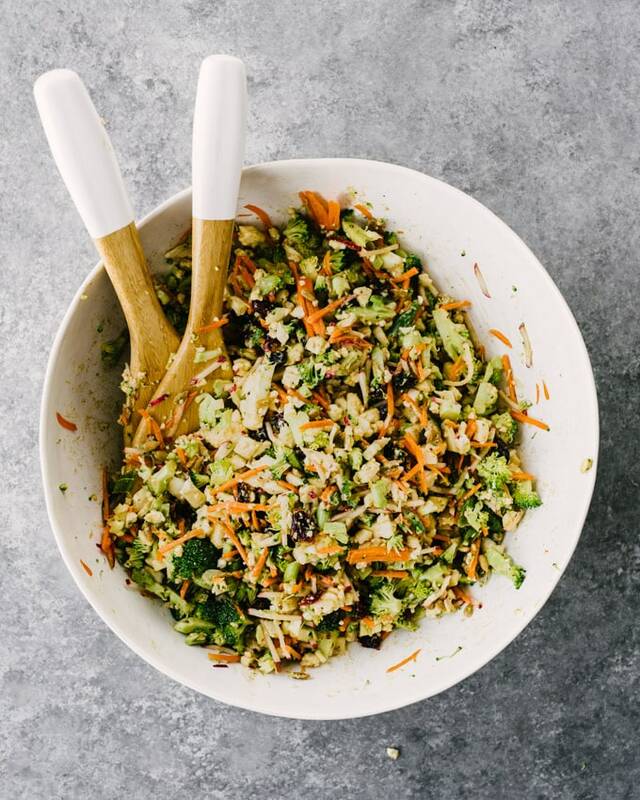 DID YOU MAKE THIS RECIPE FOR BROCCOLI CAULIFLOWER SALAD? I WANT TO SEE YOUR CREATIONS! SNAP A PICTURE AND SHARE IT HERE ON PINTEREST. This recipe was originally posted in March 2018, but updated in March 2019 with video, nutritional information, and an FAQ. Ditch the mayo and embrace this paleo, whole30, and vegan broccoli and cauliflower salad! It's a flavor bomb packed with crunchy vegetables and a creamy sunbutter sauce. Perfect for lunch prep, picnic prep, or a simple side dish. Chop a head of cauliflower into florets, then chop the florets into dime-sized pieces. To do so, cut each cauliflower floret lengthwise into several slices. Slice those pieces a second time lengthwise to create long shreds, then chop those long shreds up into tiny pieces. Prepare the carrots and radishes using a vegetable mandoline or box grater, then chop the scallions and cherries. 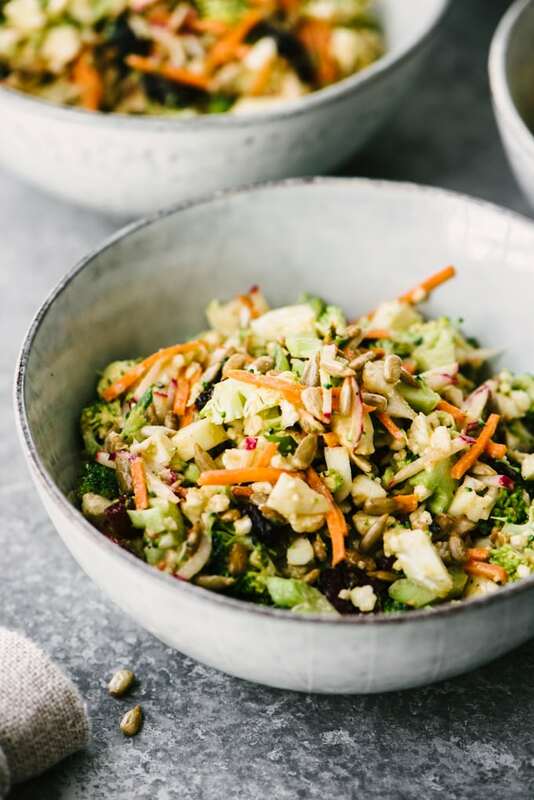 Add the broccoli and cauliflower florets to a large bowl, along with the grated carrots and radishes, sunflower seeds, chopped scallions, and dried fruit. Toss to combine. In the bowl of a food processor, add the sunflower seed butter, olive oil, lemon juice, garlic, rice vinegar, red pepper flakes, salt, and pepper. Pulse several times to incorporate the ingredients. The sauce will still be very thick. Flip the motor to continuous and pour water, 1 tablespoon at a time, through the feed tube until the sauce thins and is completely smooth and emulsified. Taste for seasoning, and adjust salt, pepper, or acid as needed (see section "How to Make Sunbutter Sauce"). Pour the dressing over the salad and toss to combine. Serve immediately, or transfer to the fridge to chill. Store this salad in the fridge in a tightly sealed container for at least 3 days. Serve warm or a room temperature. i saw this on instagram, looks SO SO good! loving the colours and flavours you’ve got going on! It took me a while to realise what sunbutter was but now I know I am SO excited about trying this salad. I think it will be my go to for week day lunches. Oh, woops! My son called sunflower seed butter “sunbutter” and it’s now so engrained in my psyche, that’s what I call it too 😀 Maybe’ll it’ll become a thing. Ha! Wow – this gorgeous salad ticks so many diet boxes! I love the sound of the dried cherries in there. The cherries really do make it. I love the little pops of sweet in every bite. Amazing. It look so fresh and delish. Genius! I love sunflower seed on salads, but this is a great way to get that seed flavor in every bite! This would be perfect for a potluck! Sounds delicious! This looks heavenly! what an incredible salad, so healthy and loaded with great veggies, specially fond of that sunbutter sauce!! Seen this recipe today on my break at work. Came straight home and made it. It’s so delicious!! I added cucumber and mushrooms to mine because I had them on hand. I will be making this recipe A LOT!! Thanks so much! Taryn made this tonight and we both loved it. I hadn’t heard of sunbutter before, but of course Trader Joe’s has it. Very tasty! Wow! Made this for lunch today and I was in love with the flavors here 🙂 I had actually never had sunbutter before but after seeing the recipe I decided to get some, and I’m glad that I did! I’m not a fan of radishes, so I omitted those and used chopped dates instead of the cranberries. I ate it over a bed of spinach for some extra veggies and it was amazing! The dressing is so delicious, I’m going to have to make more! I love the idea of chopped dates! Such a great substitution, and better on the sugar content too (I can’t seem to find sugar-free cranberries anywhere lately!). So glad you enjoyed it! This is an excellent salad so easy to make.. so healthy. I didn’t have any sunflower butter, so ground up some almonds and made almond butter. Really delicious!! This salad will definitely be one of my favorites. I love the flavors, the colors, and, yes, the crunch. It is unbelievably tasty. I didn’t have dried cherries so added an apple for a little tartness. I was looking for something new and fresh for Thanksgiving and this is it. Thanks for sharing it with us. I’m so glad you loved it – the apples are a brilliant substitution! Can’t wait to give it a try. Does anyone know how many WW points it would be per serving? I don’t have that info, but I’m hoping to add WW points to each recipe by the end of this year. It’s a big project, but stay tuned!